Now that the better weather is here and I’ve got my Optima High Baron (full review) back on the roads, it’s time to offer some early thoughts on the M5 Carbon Highracer I borrowed from Laid Back Bikes. The High Baron is already noteworthy in this class of bike for its long, relaxed wheelbase and low seating position – see my earlier Dual 700C recumbent roundup article. The CHR takes this one step further with an extra 17cm (7″) between the wheels, which does make a noticeable improvement to high speed handling. Although the Baron is extremely sure-footed, wriggling around potholes and manhole covers at 40mph the M5 is clearly a little bit ahead here. It’s almost no-hands-able. If you like the mega-twitchy style of the shorter, higher bikes, it won’t come as a surprise to hear that neither will particularly please you. The seat pan is 9cm (3 1/2″) lower on the CHR and this really opens up the bike in dense rush hour traffic – on the Baron I tend to sit on one cleat with my toes pointed down (without moving from the riding position) but it can sometimes be a bit of a strain – no bother on the Carbon High Racer. Neither bike is anything like as bad as the seating position on a Corsa or other stick bike of course. You can see that both bikes have a very similar seat recline as stock – both of these examples have a little more adjustment in the downward direction before you’d need to consider anything clever with the mounts or holes that are drilled in the seat. Ultimately the M5 has more capacity to go completely flat as you’ll end up lying on the High Baron’s chainstays at some point – but most will not be able to put out significant power at such an angle, so it’s not too relevant a distinction. The chainline is extremely similar on both bikes and both are gravely compromised in terms of low speed manoeuvrability and a tendency to throw the chain when dismounting / walking with the bike. However, this is one area where the CHR’s extreme layout starts to hinder, and with fully dropped chains, you can turn quite a lot harder on the High Baron without coming unstuck than you can on the M5. See the recent report by Mike for an illustration of the struggles that are possible here. The M5 has a nice cockpit setup with the handlebars positioned comparatively further from your chest, but this is balanced out to some extent by the extreme narrowness of the stock bars, which I found limiting (I ended up riding holding onto the actual shifters most of the time – I wouldn’t fancy this on an ultra event). Where the High Baron comfortably takes normal road bike kit, if you are of average height the M5 might need to be run with shorter cranks – I was fairly close to the limit and we did cut down the carbon boom so that the cranks could be moved as close as practicable to the seat. Shifting is not a point of distinction between the two bikes – although the SRAM Rapidfire shifters on the High Baron are far superior to the gripshifts on the CHR, it’s not like that is hard to change. The M5 CHR has competent brakes – so does my High Baron, but only after extreme effort (see the full review) so this is a plus point to M5. As for the riding experience, I haven’t had a chance to ride the CHR with power data yet, but I must say that hasn’t blown me away as I had been expecting – perhaps because ultimately the riding position is quite close between the two bikes, as is the total kerb weight (including rider). As I generally average ~20mph over a trip this will downplay differences between the two bikes aerodynamically as well. I’m hoping to get out again on the M5 soon, with better recumbent fitness so I can push the envelope a little more (and try and get some drag numbers from power data). Based on a week with the M5 CHR I’m left with an impression of a bike which is significantly more expensive and can be quite a lot harder to live with (if you ride lanes and big climbs, not if you only ride on trunk routes). It might not pay back as much interest on the investment as you were expecting, but this is definitely a first impression. In the meantime I’m building up a Schlitter Encore to add to a new three-way “best of breed” 700C article… watch this space! Oh yes, bring on the 3 way with the Encore. I just started the campaign to buy me a new bike, and the current contenders have been the Bacchetta CA2, M5 CHR, and Encore. The mouse hovers between the three, but is tending to drift towards the Encore. I will wait keenly for your thoughts. Out today on the shop’s M5 CHR. Some stats from bike computer. Nothing too sophisticated!. Run was out over Redstone Rigg. Route here: http://www.plotaroute.com/routeprofile/83064. Mileage was 62.77 miles (plot a route has errors). Run time 3.54 which equalled 16mph dead on for whole thing. First section to Gifford (approx 150m asl) was completed at 19.9mph which is high for me. I had company of an ERC member for part of this which encouraged me I think! Next section to top of Lammermuirs (427m) dropped average to 17.2mph. After that we split at junction to Garvald. Down hill speed there max at 50.3mph. Rest was lumpier on single track so a slow decline in average speed set in. Some tight turns down to Garvald where disc brakes would have helped. Overall impression was good enough to make me want to take in Aberlady on the way back! Interesting to hear your first impressions. You’re obviously far more experienced with bents if you’re close to riding the M5 no hands! Wondering about your comment re very low seat angles & limitation of power application. Also, isn’t it better to mount the return chain line under the power idler? Are they Bram’s own calipers & levers? For the last few weeks I’ve altered my seat angle to about 25′ to help with long climbs. It seems to help with low speed stability but I have noticed an average speed reduction of about 0.5mph. In addition, when I tried to compare my average speed with my DF days I did wonder about the effect of having to be more prepared for junctions & the extra time it takes. I guessed that on a 50 mile ride it was probably worth about another 0.5mph. I’m not obsessed with average speed but I do like to know where I’ve lost mine in the transition to bent riding. Look forward to reading your in depth analysis. Once again a very interesting review. 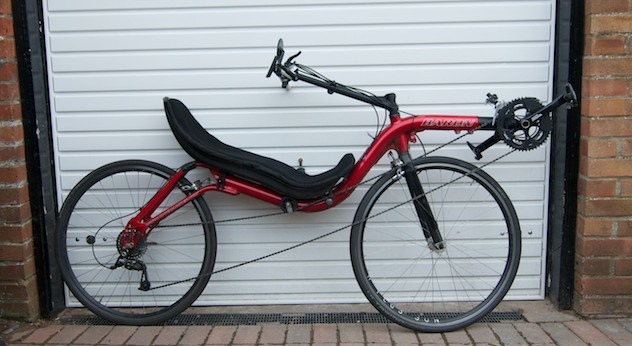 As a new-to-the-screne of recumbents and about to buy one I would appreciate if I could contact you, Dave, concerning some advice on my first recumbent purchase-decision. Mayd I contact you via email? No problem – I’ve dropped you an email. I’m sorry to bother you, but I have been reading your reviews with keen interest as I am looking to buy my first recumbant. I was looking for your thoughts on the diffence in underseat steering and over type steering?